Michael Dougherty, the director and writer of the upcoming Krampus, which I think we’ve collectively decided in advance that we love (I think because he’s The Punisher, only Christmasy and with a huge dong) (the Krampus, not Dougherty) mentions in the introduction of this collection of stories that serve as a prequel to his movie that he never cared for Christmas parties. 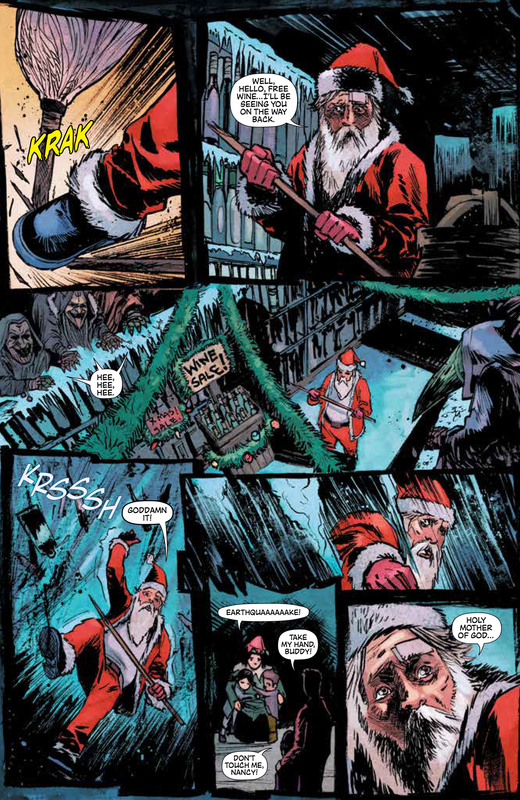 After reading Krampus: The Shadow of Saint Nicholas, Legendary’s prequel comic to the movie, two things are immediately clear: one, that he definitely loves Christmas; and two, that I’m not entirely sure he’s being honest with us. He has way too much fun with this book to be entirely anti-Christmas party. 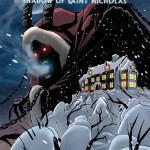 The Shadow of Saint Nicholas is a prequel anthology building out the world of the movie, and presumably giving us an early look at a lot of what we’ll see in theaters soon: the mysterious, super evil Krampus and his “elves” terrorizing a town, punishing the naughty with stuff way worse than lumps of coal or old Tiger basketball games. 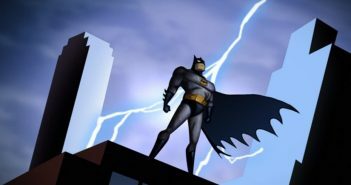 There are three individual stories tied together in a fourth, all written by Dougherty, Todd Casey and Zach Shields (with an assist on the second from Laura Shields), and drawn by different artists. The first was my favorite. 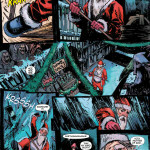 Christian Dibari draws a story of a drunk war vet mall Santa trapped in the mall with a group of abandoned kids when the freak winter storm that follows the Krampus around strikes. 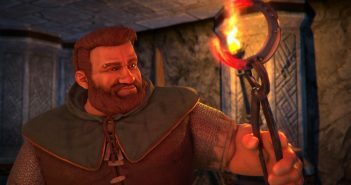 He gets his act together long enough to lead the entire group out of the mall, but their path there is full of crossbow bolts and quips, and it was a blast to read. It was dementedly funny and weird and creepy all at the same time, hitting every note that I want out of my ideal slasher movie. Dibari’s art was very good – like a scratchy Archie artist – but the best part of this story was the smart, clever writing. 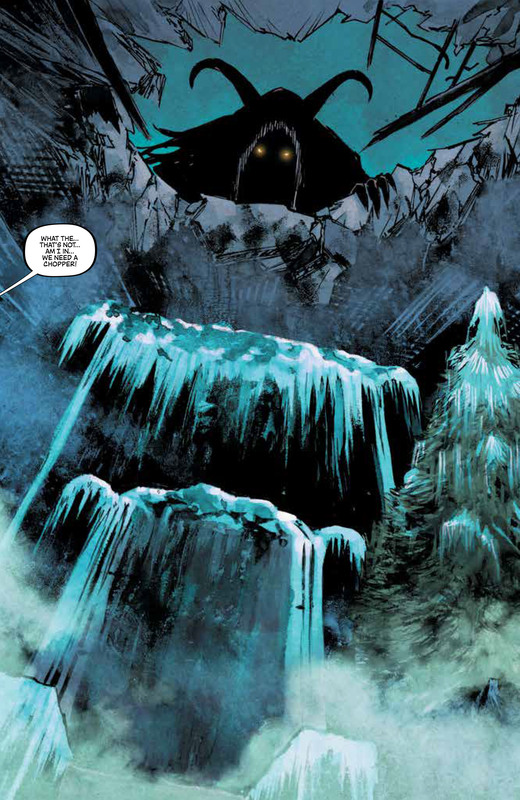 The second story is drawn by Maan House, who also did a lot of the design work for the Krampus’ elves. 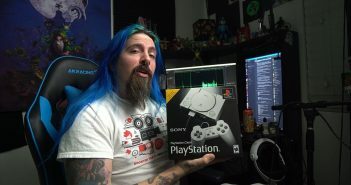 His designs are terrific. They’re just creepy enough to fit the story without ever taking themselves too seriously – which again, is exactly what the tone of this book is. His sequentials aren’t as strong, but they still do the job well enough. The story follows a cop feeling guilt about her sister’s death years ago, who finds the man who killed her robbing Christmas presents from houses on her beat. 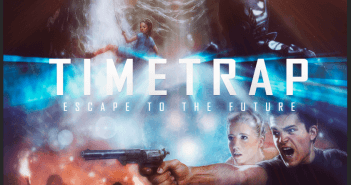 There are a couple of flashes of really exceptional art in the third story, about a group of people about to be displaced by a new development who decide to spend their Christmas eve raiding the developer’s mansion. Stuart Sayger’s pencils combine with Guy Major’s colors to make the panel of Tad Ferguson, the town’s mustache-twirling evil builder, look Sienkiewiczian. 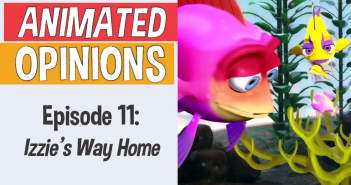 Sayger’s figures are a little loose and sketchy, but that’s less important than the overall mood he conveys with the story, and he does a terrific job. The final story brings everyone together, rehabilitating Tad Ferguson as a Scroogeish figure, having him bring the Grinch’s sleigh around the town handing out presents. It’s a nice little conclusion to a fun book, even if it’s been done before. Michael Montenat draws it, and the colors immediately brighten and really aid the tone that the writing team was shooting for. 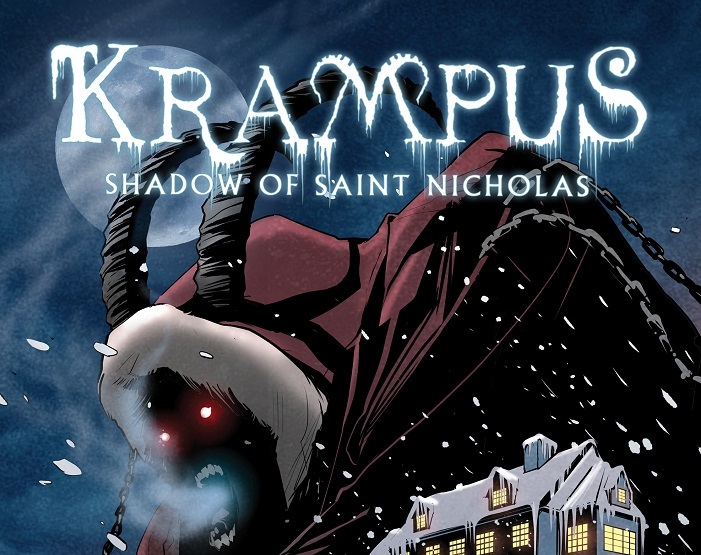 Krampus: The Shadow of Saint Nicholas is a good way to expand the world that Dougherty built in the movie and has some really interesting art contributions. It also has a ton of fun with what, in less skilled hands, would have been generic, tired, shock and gore commentary. It’s good stuff, and it’s out today in bookstores and online, and tomorrow at comic shops. If you’re not sold yet, check out these preview pages from the book!